See Additional Imagery for supplemental imagery from Beatty et al. (2012). Trichechus senegalensis, the African manatee, is one of four extant members of Sirenia. Also included in Sirenia are two other species of Trichechus and the dugong, Dugong dugon. Manatees are heavy and fusiform in shape reaching lengths of 4 m and 500 kg (Husar, 1977, 1978b, 1978c). They have horizontally flattened tails, large paddlelike forelimbs, and lack hindlimbs. Recent analyses of molecular data place Sirenia in the clade Afrotheria, which also includes aardvarks, elephants, hyraxes, golden moles, tenrecs, and elephant shrews (Murphy et al., 2001). Within Afrotheria, sirenians form a clade with hyraxes, which is the sister taxon to elephants (Murphy et al., 2001). Morphological data place Sirenia as the sister taxon to Proboscidea in a clade that also includes hyraxes and perissodactyls (Novacek, 1992a, b). The African manatee is native to rivers, estuaries, and coastal regions of West Africa from Senegal to Angola (Husar, 1978c:2). The other two species of Trichechus are distributed along tropical and subtropical coastal regions of the New World Atlantic including the southeastern United States, the Caribbean, Mexico, and Central and northern South America (Husar, 1977, 1978b). The range of Dugong includes the Red Sea, the Indian Ocean bordering western Africa and eastern India, and the Pacific Ocean surrounding southeast Asia, New Guinea, and northern Australia (Husar, 1978a). In Recent times, Hydrodamalis gigas, Steller’s sea cow, occupied the Bering Sea. This species, now extinct, reached a length of over 7.5 m (Forsten and Youngman, 1982). The earliest fossil record of manatees is from the lower Miocene of South America (Husar, 1978c). The earliest fossil record of dugongs is from the Eocene of Jamaica, Europe, North Africa, and South America (Husar, 1978a). The African manatee feeds on a number of vascular aquatic plants. Sirenians in general are slow moving and passive animals, rarely expressing playful or aggressive behavior. Manatees are mainly solitary except for nursing females; dugongs, however, are more gregarious. Several bones in the manatee skeleton are pachyostotic, extremely thickened and dense, including the skull. The skull of Trichechus senegalensis is broad and characterized by a short snout, robust zygoma, and very robust ear ossicles. Two vestigial incisors are present in each jaw, but they are resorbed later in ontogeny (Husar, 1978c:2). Five to seven functional cheek teeth are present in each jaw at any time (Husar, 1978c:2). The teeth are brachydont, lack cement, and have closed roots (Husar, 1978c). The cheek teeth are replaced from the rear, with up to 20 teeth estimated for each jaw (Husar, 1978c:2). Humans are the only documented predators of manatees and dugongs. Manatees are highly sought for their meat, oil, bones, and skin in certain parts of the world. Shark nets and wounds inflicted from motorboats also take their toll on these animals. Consequently, all species of manatee and the dugong are listed as vulnerable by the IUCN. Trichechus senegalensis is also listed on Appendix II of CITES. This specimen (AMNH 53939) was collected by Herbert Lang, August 1915 in Congo. It was made available to the University of Texas High-Resolution X-ray CT Facility for scanning by Ted Macrini of the University of Texas. Funding for scanning was provided by a National Science Foundation Dissertation Improvement Grant (DEB-0309369) to Mr. Macrini. Funding for image processing was provided by a National Science Foundation Digital Libraries Initiative grant to Dr. Timothy Rowe of The University of Texas at Austin. The specimen was scanned by Matthew Colbert on 21 October 2003 along the coronal axis for a total of 560 slices, each slice 0.5 mm thick with an interslice spacing of 0.5. Forsten, A., and P. M. Youngman. 1982. Hyrodamalis gigas. Mammalian Species 165:1-3. Husar, S. L. 1977. Trichechus inunguis. Mammalian Species 72:1-4. Husar, S. L. 1978a. Dugong dugon. Mammalian Species 88:1-7. Husar, S. L. 1978b. Trichechus manatus. Mammalian Species 93:1-5. Husar, S. L. 1978c. Trichechus senegalensis. Mammalian Species 89:1-3. Kaiser, H. E. 1974. Morphology of the Sirenia. A Macroscopic and X-ray Atlas of the Osteology of Recent Species. Karger Publishers. Murphy, W. J., E. Eizirik, S. J. O’Brien, O. Madsen, M. Scally, C. J. Douady, E. Teeling, O. A. Ryder, M. J. Stanhope, W. W. de Jong, and M. S. Springer. 2001. Resolution of the early placental mammal radiation using Bayesian phylogenetics. Science 294:2348-2351. Novacek, M. J. 1992a. Fossils, topologies, missing data, and the higher level phylogeny of eutherian mammals. Systematic Biology 41:58-73. Novacek, M. J. 1992b. Mammalian phylogeny: shaking the tree. Nature 356:121-125. Nowak, R. M. 1991. Walker’s Mammals of the World. Volume 1. Fifth edition. The Johns Hopkins University Press, Baltimore. Trichechus manatus, the Florida manatee, on the Comparative Mammalian Brain Collection. Click on the thumbnail to the left for a pitch animation (1.8 mb) of the Trichechus cranial endocast highlighted in red within the skull, which is rendered semi-transparent. 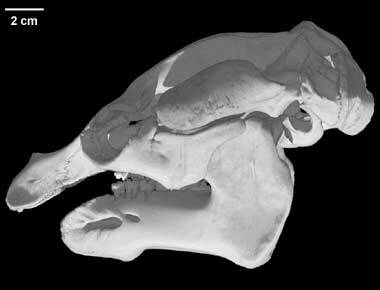 Click on the thumbnail to the left for a pitch animation (1.2 mb) of the isolated Trichechus cranial endocast. Click on the thumbnail to the left for a roll animation (1.7 mb) of the Trichechus cranial endocast highlighted in red within the skull, which is rendered semi-transparent. Click on the thumbnail to the left for a roll animation (1.3 mb) of the isolated Trichechus cranial endocast. Below is supplemental imagery for Beatty, B.L., Vitkovski, T., Lambert, O., and Macrini, T.E. 2012. Osteological associations with unique tooth development in manatees (Trichechidae, Sirenia): a detailed look at modern Trichechus and a review of the fossil record. The Anatomical Record, 295, 1504-1512. Click on the thumbnail to the left for a sagittal CT image showing the segmented upper dentition (blue) on the right side of the skull. Click on the thumbnail to the left for a sagittal CT image showing the segmented upper dentition (blue) on the left side of the skull. Click on the thumbnail to the left for a 3D rendering of the isolated upper dentition in occlusal view. Click on the thumbnail to the left for a 3D rendering of the isolated upper dentition in dorsal (root) view. Click on the thumbnail to the left for a 3D rendering of the isolated upper dentition in right oblique view. Click on the thumbnail to the left for a 3D rendering of the upper dentition (green) in the semi-transparent skull in dorsal (root) view. Upper bony crypts are shown in pink. Click on the thumbnail to the left for a 3D rendering of the lower dentition (green) in the semi-transparent skull in ventral (root) view. Upper dentition (green) and upper bony crypts (pink) also shown. Click on the thumbnail to the left for a 3D rendering of the upper and lower dentition (green) in the semi-transparent skull in left lateral view. Upper bony crypts shown in pink. Click on the thumbnail to the left for a 3D rendering of the upper and lower dentition (green) in the semi-transparent skull in posterior view. Upper bony crypts shown in pink. Click on the thumbnail to the left for a cutaway 3D rendering of the posterior portion of skull at the anterior beginning of bony crypts (green). To cite this page: Dr. Ted Macrini, 2004, "Trichechus senegalensis" (On-line), Digital Morphology. Accessed April 25, 2019 at http://digimorph.org/specimens/Trichechus_senegalensis/.